What a great conference! AESC certainly delivered some top notch research presentations this week. My highlights from the last few days of the conference have been at very different ends of the geologic timescale - Southern Hemisphere Quaternary, and Neoproterozoic Earth. The resolution of investigation and interpretations are strikingly different when listening to presentations on these different ages of succesion. We heard from several high-resolution palaeoclimatic interpretations from lake, marsh and ocean cores, helping to shed light on key research questions such as what reconstructions of hydrological variability from around Australia can tell us about continental scale and global atmospheric climate during the Quaternary, the reconstruction of the position and strength of ocean currents, and whether hydrological variability and increases in dust accumulation could be related to megafaunal extinction. 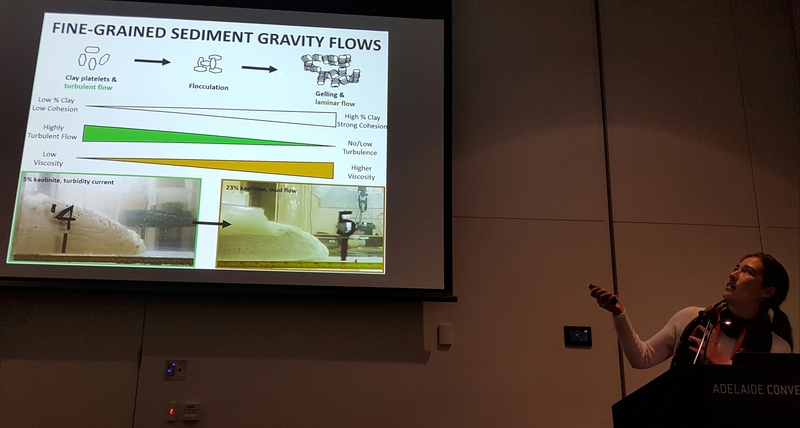 Dust also featured in the final plenary presentation by Prof. Paul Hoffman about Snowball Earth, which also highlighted the role of cap carbonate sedimentology, stratigraphy and geochemistry in our reconstructions of this time. The usefulness of detrital zircon chronologies for piecing together the palaeographic reconstructions of ancient basins was seen in several presentations. The next AESC won't be for another two years, but there are tentative plans in the pipeline for a GSA Sedimentology Group field workshop during 2017. Watch this space! 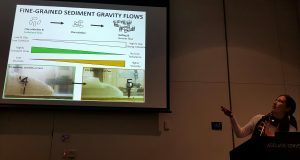 The Australian Earth Sciences Convention is off to a great start today with some excellent sedimentology presentations. Highlights included the Reservoir Analogues session talks, including an interpretation of the Durham Downs gas field fluvial reservoirs, a modern study investigating why rivers avulse, a detailed outcrop investigation of fluvial-deltaic and salt-withdrawal minibasin deposits in the Flinders Ranges, and an investigation of the influence of organic matter on dynamics of clay sediment gravity flows. Another highlight was the full day of presentations on the scientific results of the International Ocean Discovery Program. We're looking forward to the next 3 days of the conference! By Gresley Wakelin-King and Kathryn Amos. Dryland environments form an important part of the rock record, yet there is a lot that we don’t understand about the sedimentology and geomorphology of these systems. Studies of more modern drylands will help us to better interpret the deposits from similarly arid in the ancient record. The rock record around the world includes many fluvial deposits laid down in dryland basins within stable continental interiors (intracratonic), some of which are significant hydrocarbon reservoirs. Within a hydrocarbon province, the spatial arrangement and connectivity of permeable rocks is an important influence on resource value. In clastic sediments, sands and muds are a key factor in permeability, and understanding sediment distribution patterns is important for predicting reservoir, seal, migration pathway and production properties. An effective way to study modern analogues is to combine geomorphology and sedimentology: the sediment content in, and spatial relationships between, landform elements not only maps lithology distributions, it also demonstrates the agents and processes that link landforms in causally-related systems which govern sediment distribution. These processes operate across scales from macro (basin scale) to micro (sedimentary structures and grain scale) and can be used to inform facies models, can be set within a process-based and sequence stratigraphic hierarchy. Dryland rivers are more diverse than has been recognised in the past, and the Australian drylands’ history of tectonic stability under a variety of climates has created landforms that are in some ways dissimilar to other drylands of the world. The present surface of Australia’s Lake Eyre Basin contains a range of varied depositional environments, which are a presently under-utilised modern analogue for ancient fluvial systems. Its remote location and harsh climate means that its rivers are considerably under-researched, with great potential for future investigations. The Lake Eyre Basin (LEB) occupies more than one seventh of the Australian continent, and is a wide and shallow inland-draining (endorheic) basin. The depocentre is the large playa lake Kati Thanda – Lake Eyre. Potential annual evaporation greatly exceeds annual rainfall throughout the basin, and so its rivers are dryland systems. The rivers of the Channel Country in the eastern LEB are within reach of monsoonal rains, and tropical depressions sometimes bring heavy rain to central Australia. The present surface of the LEB consists of sandy and/or muddy depositional lowlands (river valleys, lakes, plains and sandy dunefields) fringed by and separated by non-depositional or erosional uplands (rocky uplands, alluvial fans, desert pavements, residual red-earth or black-soil plains). Modern sediments are in onlap, downlap and basin-fill relationshops with the underlaying formations. It is important to note that the floor of the playa Kati Thanda – Lake Eyre is not the only base level of relevance to LEB rivers. Slow uplift in the Innamincka Dome constrains Cooper Creek into a narrow valley, with flow and sediment impounded upvalley of the dome; similar local uplift controls a local base level and acts as a barrier to downvalley sediment transport on the Diamantina and Georgina Rivers. An example of an under-studied fluvial process and related deposits is that of arid-zone river floodouts, which are a common feature of the Australian dryland landscape. The description and interpretation of fluvial networks with downstream-radiating channels that decrease in size and sand:mud rations downstream have been the topic of some debate in the published literature of late. The LEB has a diversity of fluvial systems that fit this general description. In geomorphic terms, they are either floodouts, or drainage networks on low-angle alluvial fans. As sedimentary packages, some are depositing valley-or basin-fill, and some are downlapping from a locally elevated base-level onto a lower-elevation surface. Floodouts are a landform in which a downstream decrease in sediment transport capability leads to declining channel capacity and an increasing proportion of overbank flow. Eventually the channel ceases to exist, and floods travel as unchannelised shallow flow across river reaches that are effectively 100% floodplain. The Finke River Floodout is the terminus of the Finke River, a river with a sandy bedload and single-thread pattern. It is semi-confined and partially sinuous within the valley of the larger palaeo-Finke River. As the Finke River approaches the depositional lowlands of the Simpson Desert, its valley widens and the river channel widens, shallows, and becomes multi-thread and unstable (Figure A). Channel width decreases with distance downstream, and floodplains are more often inundated than they are upstream. The valley margin widens abruptly (B) to form a non-lacustrine topographic basin ~ 20km wide, and channel size diminishes rapidly through a series of bifurcations (C, D). The channel terminates ~ 8.5km downstream from its entry into the basin. Channel sediments are deposited in flat-topped 2D dunes and low-flow regime planar beds in shallow cut-and-fill structures. Bifurcations have a major and a minor arm; the major arm propagating flow and sediment downstream into the floodout and leads to the next bifurcation. Lobes of sediment are deposited adjacent to and downstream of the ends of the bifurcated channels (C). At present, four bifurcated channels are actively carrying flow (C), three of which are delivering water to low-elevation swampy areas, and one is currently depositing sandy sediments (D). The channels here are therefore not distributary in terms of sediment load. Downvalley, unconfined flow travels ~ 20k m across floodplain. In some places, short discontinuous channels are formed before these floodout again. No subsurface investigations have been conducted here to date; surface geomorphology indicates that preserved in the rock record these sediments would present as weakly stratified or massive bioturbated silty sands with organic-rich horizons, common rhizomorphs, cut-and-fill structures, and sparse Aeolian layers. 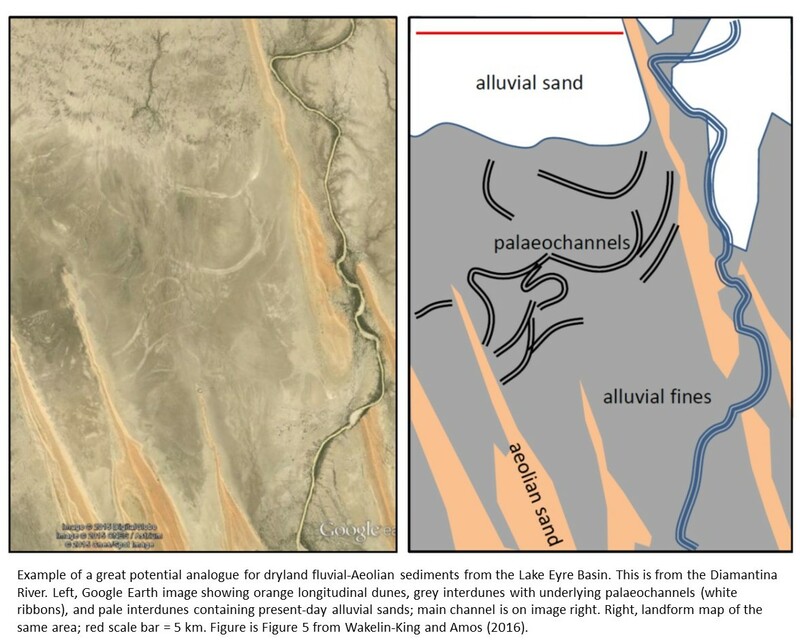 *This text and figures have been taken from a recent publication by Wakelin-King and Amos (2016) A time-slice of the Lake Eyre Basin: Sand/mud depositional geometries in a diverse lowstand endorheic drylands setting. Eastern Australian basins Symposium: Publication of Proceedings, 97-113. - Nanson, G.C., Tooth, S. and Knighton, A.D., 2002. A global perspective on dryland rivers: perceptions, misconceptions, and distinctions. In: Bull, L.J. and Kirkby, M.J. (eds. 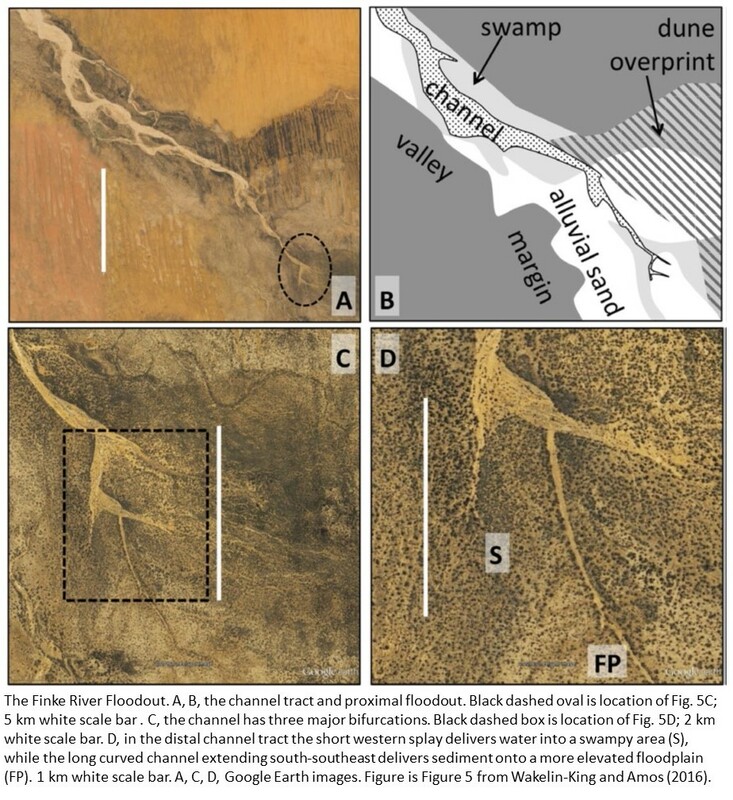 ), Dryland Rivers: Hydrology and Geomorphology of Semi-Arid Channels. John Wiley and Sons, Chichester; pp. 17-54. - Tooth, S., 2000a. 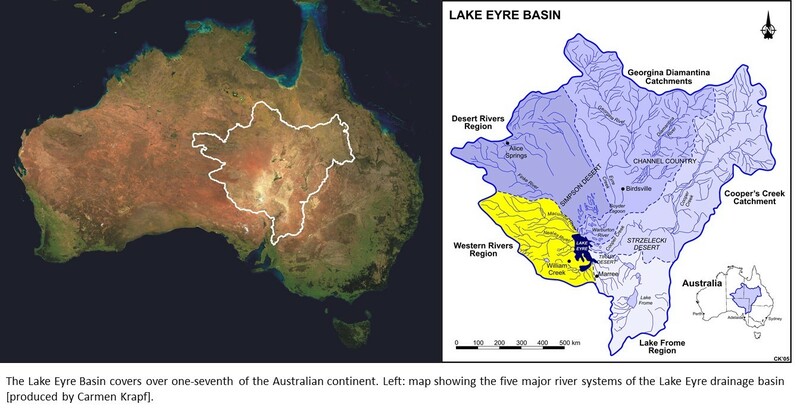 Process, form and change in dryland rivers; a review of recent research. Earth-Science Reviews 51: 67-107. 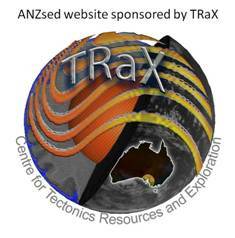 The program for the upcoming Australian Earth Sciences Convention is now published, and it looks like there will be some excellent sedimentology and stratigraphy presentations. There will hopefully be a meeting of the GSA Sedimentology Special Interest Group during AESC; we’ll post an announcement here when it is arranged. I've had a look through the program and extracted presentations with a sedimentology focus. If you think I've missed any, please post details in the comments! Experimental analogue study - How does organic matter affect the head velocity and run-out distance of cohesive sediment gravity flows? PhD opportunity in palaeoenvironmental reconstruction at James Cook University. As part of an Australian Research Council Laureate Fellowship, Professor Michael Bird is seeking to appoint a PhD student in the general areas of sedimentology, geochemistry and/or palynology. The Laureate project will produce terrestrial records of environmental change before, during and after the arrival of humans in Australian tropical savannas. Applicants with a Masters Degree or a First Class Honours degree and an appropriate background in Earth Sciences, Physical Geography or Archaeology should contact Michael Bird for further information (http://research.jcu.edu.au/portfolio/michael.bird) Closing date for expressions of interest: June 30th, 2016 Start date: as soon as possible. Three new Level B Lecturer in Geography positions have been advertised by the University of Queensland. One of their forward foci areas is coastal and marine physical processes and geohazards. Applications close 10th June. The advertisement and application details can be found here http://jobs.uq.edu.au/caw/en/job/499057/lecturer-in-geography.